You can never trust what you see from hollywood on TV shows. As memory serves me, the SFPD was using Motorola HT220's. The 220 series was introduced in 1969. And the HT220 did have a telescoping antenna option. Scrutinizing the radio he's holding, and the leather case, neither look to be a Motorola HT-220 (even a SlimLine model) or a genuine Motorola HT-220 leather case. AND, looking at the telescopic antenna in the photo, it is positioned very close to the outer left edge of what appears to be the radio itself, whereas the antenna on the HT-220 wasn't mounted as close to the edge. FINALLY, the HT-220's antenna mount is on the RIGHT side of the radio, as you are facing it (see below). So, Inspector Callahan ain't holding a Motorola HT-220. Probably some CB walkie talkie that the prop guy had. That's a GE "Pocket Mate" portable radio. They were also sold under the Bell and Howell name. At one point in the early 1980s, they were very popular for conversion on 2 meters. I knew a few guys that had them. As someone said, don't believe any of the technology they use in movies. They use PROPS that advance the story, they don't care about technical accuracy. 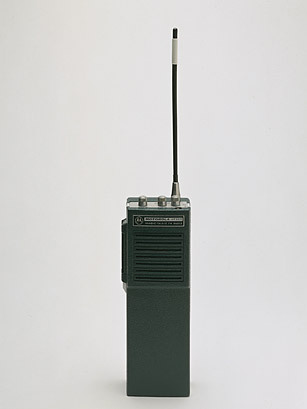 The Pocket Mate was GE's first actual hand-held radio and designed to compete with Motorola's HT-200 which had been introduced in early 1963. The Pocket Mate is believed to have been introduced about 1965 and is much smaller than competitor Motorola HT-200. The Pocket Mate is almost as bizarre in appearance as the Voice Commander or the Accent 450 radios. A peculiar captive telescopic whip antenna was permanently attached, and flipped upwards on the side of the radio to a vertical orientation. The round speaker in the front center also acted as the microphone, a design flop repeated by many designers over and over again throughout the 1960's and into the early 1970's, including the Motorola HT220. A round push-to-talk button near the top on one side completed the strange appearance of this ugly two-tone radio. The Pocket Mate was made only in VHF versions and is rare. They were also made under Bell & Howell and Kel-Com brand names in a dark, solid gray color style. The Pocket Mate was the radio found in the possession of the Watergate burglars during the famous Nixon era Watergate debacle. Some were apparently also used by the Secret Service and various covert agencies, which in retrospect leads me to pity them a bit for having to use what I think is a silly looking radio. For reasons unknown, the Pocket Mate and its relabeled versions are very rare today. I think SFPD might have been on low band in the early 1970s, but I"m sure that someone who knows the area can comment on that. Thanks Garys... nice piece of history. Despite its design flaws it looks pretty good for that time period. Some radio manufacturer's could also take a lesson from that manual. Very thorough! Back in the days of large discrete components that could be repaired with standard components and a soldering gun. Not that I don't like all the new stuff, but there is some degree of nostalgia for those old radios that had character. Until I came across the listing on Geoff's site, I didn't realize that they were GE radios. The ones I saw were labeled Bell and Howell. From the hams I knew back then, one of whom worked at a two way shop as a tech, I got the impression they weren't cheap even used. The specs on that are pretty good. Five eight hour days on a non rechargeable battery at 10/10/80. When I arrived in the Bay Area in 1971 SFPD was mostly lowband with a few VHF frequencies used for detectives, vice, etc. Sometime in the 1970s (and I'll be checking this soon) they inaugurated their PIC (Portable Interunit Communication, I believe) system, a set of UHF repeaters for out-of-car use. Most of the first UHF handhelds were Hallicrafters, I believe. Around 1977-78 they began to deploy Motorolas, initially 6 channels, perhaps 8 later on. The orginal UHF hand-held radios used by SFPD were indeed manufactured by Hallicrafters... This system was known as PIC "Personal Instantaneous Communications" and provided several decades of reliable service eventually being replaced in the mid-90s' by the current 800 MHz Trunked Radio System. Originally the PIC System operated on the following frequencies: 460.075 Z-4 / 460.125 Z-2 / 460.225 Z-1 / 460.350 CW-2 / 460.450 CW-1 / 460.500 Z-3 and used multiple Motorola "Spectra-Tac" voting receivers covering the desired police districts (PIC Zones 1-4) along with 2-channels that were designated for citywide use. UHF repeaters were located in the various police districts to provide the desired radio coverage. All channels / systems were wireline control back to the SFPD communications dispatch center which was then located at The Hall Of Justice, 850 Bryant Street. In later years, 460.525 / 460.550 and 460.025 MHz were added to the mix and were used by specialized units within SFPD. The departments primary 2-way radio communications took place on low-band frequencies 45.100 / 45.140 / 45.460 and 45.580 MHz. In the early days prior to implementation of the PIC System once the officers departed the vehicle they had no radio communications with headquarters.